One side effect to football season, at least every four years: Somebody insists on holding an election. This year, the Republican National Convention will conclude the same day the college football season begins. And by the time Navy and Air Force kick off Sept. 1, the Democrats will be trickling into Charlotte for their gathering. Here, President Obama shakes hands with Air Force quarterback Tim Jefferson during an April 23 ceremony in the East Room of the White House. 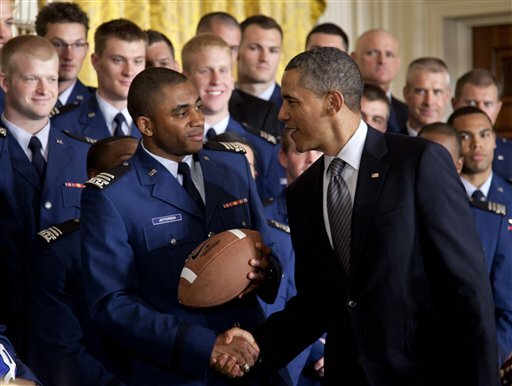 At the ceremony, Obama presented the Falcons with the 2011 Commander in Chief’s Trophy, awarded annually to the service academy with the best record in Army vs. Navy vs. Air Force showdowns. Army won the first one in 1972. The 2011 honor was Air Force’s second in a row; their 2010 trophy win broke an eight-year drought. 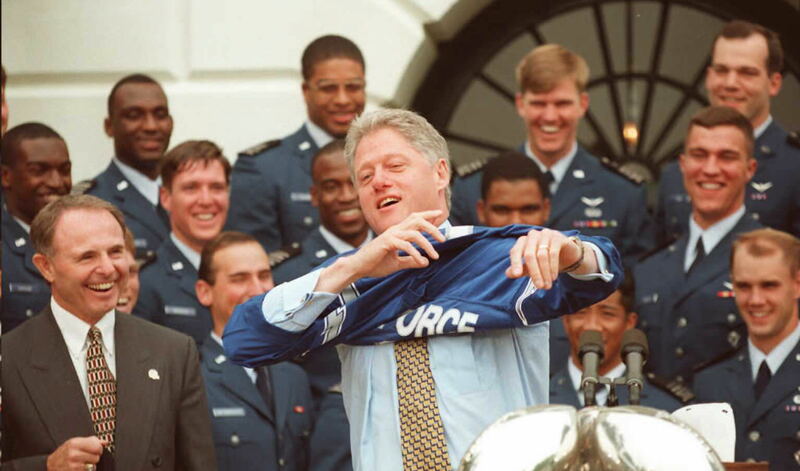 Above, a smiling Fisher DeBerry watches President Clinton try on an Air Force jersey during the 1996 ceremony honoring the 1995 trophy winners. Not an Air Force fan? Not a Democrat? Tune in tomorrow.